Himachal Pradesh is a state that is full of surprises. With villages, towns and cities, all spread with lush greenery and stunning vistas of giant mountain ranges, you can never fall short of places to discover in this wonderful state of our country. One such quaint hamlet is Kasol. Kasol is a tiny mystical village that is nestled on Parvati Valley and comes under the Kullu district. River Parvati flows beside this village, enhancing the enchanting beauty of the village. It is located about 37 km from the popular hill station Kullu and 228 km from the capital city of Shimla. 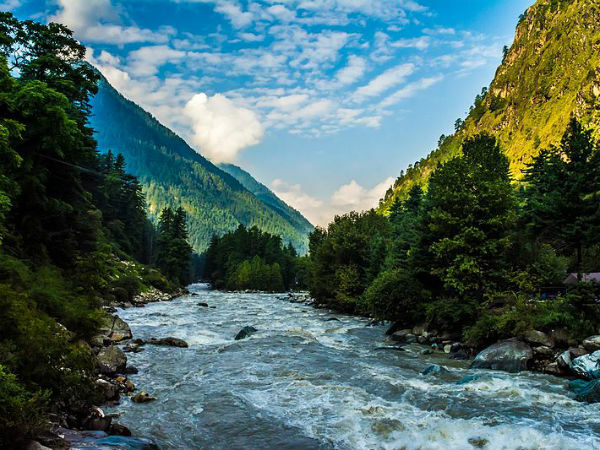 A trip to Kasol will give you the right escape from city blues since you get the view of breathtaking snow-capped Himalayas and refreshing river Parvati quietly flowing through the village coupled with a pleasant weather. Kasol gained significance ever since Israeli inhabitants started dominating the village. Due to this, you can find road signs written even in Israeli, cafes and restaurants serving delicious Israeli as well as many different kinds of cuisines. Although the village has a relatively pleasing weather throughout the year, the ideal time to visit is between the months of October to June. The temperature dances between 15 to 22 degree Celsius during this time leading to a pleasantly cool climate. Perched at a height of about 10,000 ft, the trek to Kheerganga is 9 km long, which takes about 6-7 hours to be completed. Although this trek is quite challenging due to its steep terrain, it is still one of the easiest treks that can be made in Himachal Pradesh. The base camp is at a small village called Tosh and the vistas of pristine nature you witness on the way will surely leave you spellbound. Other popular treks around Kasol that you can try include Pin Parvati trek, Sar Pass Trek, to name a few. Enhance your experience by camping by the pristine nature for a night. The river Parvati is an immaculate waterbody that gurgles across Kasol. You can take a stroll by this stunning river on a quiet evening and observe nature at its best. With enough force of rapids, you can even try river rafting. Otherwise pick up a fishing line and try trout fishing. Since Kasol is dominated by a good number of Israeli inhabitants, you must try their distinct cuisine in the restaurants lining the village. In fact, Kasol is fondly known as Mini Israel for this reason. Some of the dishes you must try include chicken lafa, meatballs, and for the vegetarians, try hummus, falafel or grilled eggplant. Kasol is one of the many villages in Himachal Pradesh that is blessed with nature's beauty. Some other villages that you must visit around Kasol include Tosh, Malana, Naggar, Bhuntar, Chalal, to name a few. Kasol is also dotted with many temples, such as Manikaran Sahib, which is a popular gurdwara of the region, Bijli Mahadev Mandir, Dhakpo Shedrupling Monastery, which is about 12 km from Naggar, etc.